He was born on the island of Luzon in Calamba, in the Province of Laguna not far from Manila, on June 19, 1861 and his complete name was Jose Protacio Rizal Mercado y Alonzo. He was the seventh son of 11 children. Rizals parents were educated and belonged to distinguished and wealthy families. His father, was a sugar planter and landholder and his mother was Chinese. Jose Rizal was a precocious boy and could already recite the alphabet at the age of two. At the age of four he wrote already sentences in Tagalog as well as Spanish. Jose Rizal had good schooling. On March 14, 1877, when he still was 15 he finished already his bachelor’s degree at the Ateneo Municipal, a school run by Jesuits. Supported by his brother Paciano he left Philippines on May 3, 1882. A Spanish ship took him to Singapore and there, he boarded a modern French liner for Marseilles. From Marseilles he went to Spain by a night train on June 13. 1882. He starts his studies in Barcelona and in the same year he moved to Madrid. At Universidad Central de Madrid (UCM). he studied Letters, Medicine, particularly Phthalmology and Philosophy. He obtained his licentiate in medicine with creditable performance in his medical subjects and had become one of the premier students at UCM, rated ‘outstanding’ in general, Greek, Latin and Spanish literature, and the same in history and advanced Greek, and Hebrew. After he finished his studies in Madrid In 1855 and became a Dr of Philosophy, he left Spain and went to Paris, France, and studied there Ophtalmology under Professor Wecker. For study the same subject in Germany under the tutelage of Professor Becker he went In February 1886 to Heidelberg where he earned a second doctorate. Later, Rizal's second European sojurn was the most productive period of his life. In London in 1889 he did historical research for eight months in the library of the British Museum. At this time, the Filipino expatriates in Spain founded an association, called La Solidaridad and they elected Rizal as an honorary president. They also founded a journal with the same name in pusuit of their political agenda and Rizal was a frequent contributor. Rizal began writing his 'Noli me Tangere' in 1884. In Wilhelmsfeld near Heidelberg he finished this famos novel and in In March 1887, Rizal was only 26, he released Noli Me Tangere, his first book. 'El Filibusterismo' was Rizal’s second novel and the sequel to 'Noli Me Tangere'. In this book, Dr. Rizal clarified his political ideas. Rizal's books angered the Spaniards and the hispanicized Filipinos due to their insulting symbolism. José Rizal's writings are also very critical of Spanish friars and the atrocities committed in the name of the Church. Because of that Rizals books were immediately banned by the friars in his country at that time. 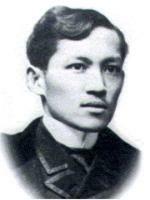 In 1892 Jose Rizal returned to the Philippines and on July 3 1892 he organized La Liga Filipina, a political group that called for peace change for the islands of Philippines. But Spanish officials were displeased and Captain General Despujol ordered Rizal's exile to Dapitan in the province of Zamboanga on the island of Mindanao. In Dapitan, he opened a school , built a hospital and a water supply system. After four long years Rizals exile in Dapitan ended because he was accepted as a medical doctor to work with the Spanish army in Cuba. But in the Philippines, the political crisis was escalating and the Philippine Revolution broke out under the leadership of Andres Bonifacio. Bonifacio were using Rizals name and writings as inspiration and as a war-cry. When Rizal reached Barcelona, he was arrested and brought back to Manila to stand trial by court martial. He was accuse of instigating and leading the rebellion, sedition, and conspiracy. Rizal was convicted on all charges and sentenced to death. From November 3, 1986, to the date of his execution, he was committed to Fort Santiago. In his prison cell, he wrote an untitled poem, now known as "Ultimo Adios"
Jose Rizal was executed by firing squad on December 30, 1896. 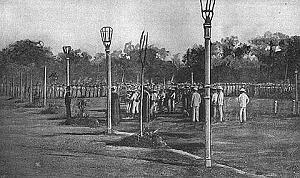 7:00 a.m.
His last word, said in a loud voice: "consummatum est" -"It is finished"
The place of execution was called Bagumbayan and later known as Luneta. 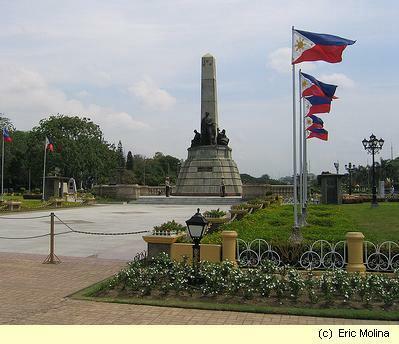 Now the place is officially renamed Rizal Park in tribute to Jose Rizal as the national hero of the Philippines.